Des recettes traditionnelles revues pour être utilisées aujourd’hui, par exemple la recette du rouge d’Andrinople (garance sur du coton), mais également bien d’autres. For several thousand years, all dyes were of animal, vegetable, or mineral origin, and many ancient civilizations possessed excellent dye technologies. The first synthetic dye was produced in 1856, and the use of traditional dyes declined rapidly thereafter. By 1915 few non-synthetics were used by industry or craftspeople. The craft revivals of the 1920s explored traditional methods of natural dyeing to some extent, particularly with wool, although the great eighteenth- and nineteenth-century dye manuals, which recorded the older processes, remained largely forgotten. In The Art and Craft of Natural Dyeing, J. N. Liles consolidates the lore of the older dyers with his own first-hand experience to produce both a history of natural dyes and a practical manual for using pre–synthetic era processes on all the natural fibers–cotton, linen, silk, and wool. A general section on dyeing and mordanting and a glossary introduce the beginner to dye technology. In subsequent chapters, Liles summarizes the traditional dye methods available for each major color group. Scores of recipes provide detailed instructions on how to collect ingredients–flowers, weeds, insects, wood, minerals–prepare the dyevat, troubleshoot, and achieve specific shades. 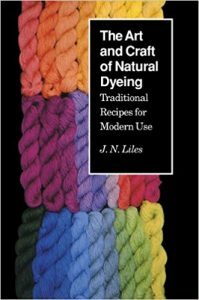 The book will appeal not only to beginning and veteran dyers but to students of restorations and reconstruction as well as to craftspeople–spinners, quilters, weavers, knitters, and other textile artists–interested in natural dyes for their beauty and historical authenticity. The Author: J. N. Liles is professor of zoology at the University of Tennessee, Knoxville. He has taught at Arrowmont School and other regional craft schools and has exhibited his work at the Arrowmont School, the Southern Highland Handicraft Guild Folk Art Center, and the Carol Reece Museum. Cette entrée a été publiée dans Bibliothèque, Teinture végétale, et marquée avec teinture végétale, le 13 janvier 2013 par Tricofolk.